Paramacharya Sadasivanatha Palaniswami is one of the stewards of Saiva Siddhanta Church, Himalayan Academy and Hindu Heritage Endowment. He is the leader of the Ganapati Kulam, the monastic team responsible for all book and magazine production, translations, artwork, our websites and Innersearch travel-study programs. He is intimately involved with the design and construction of Iraivan Temple, working with the master builders. Since 1979 he has been editor-in-chief of Hinduism Today magazine. He acts as the senior counselor to the monastic community and guides the monastery's relationships with other Hindu organizations and interfaith religious forums. On retreat days, he fulfills the monastery's vision of a sacred garden and tropical paradise by collecting, propagating and planting sacred, medicinal, culinary and tropical plants and trees around the monastery grounds. Sannyasin Senthilnathaswami, a member of the Ganapati Kulam, assists Bodhinatha, Paramacharya Sadasivanathaswami and Acharya Kumaranathaswami in the editing, design and production of all our publications. He helps guide much of the technological advancement in the monastery, including our websites, our presence on social networks and other Internet initiatives, and manages computer hardware and software upgrades in collaboration with our professional IT consultants. Swami is responsible for the production of the monastery's videos. He writes and edits articles for Hinduism Today. He travels and works with Bodhinatha in coordinating with various Hindu college groups around the country. He is one of the swamis who performs the weekly homa in Kadavul Temple. On retreat days he loves to cook and bake, conduct hikes with the younger monks and spend time in his yoga practices. 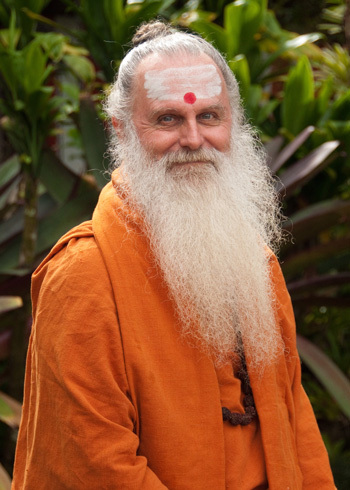 Vedacharya David Frawley (Pandit Vamadeva Shastri) is a western born teacher in the Vedic tradition. In India, Vamadeva is recognized as a Vedacharya (Vedic teacher), and includes in his scope of studies Ayurveda, Yoga, Vedanta and Vedic astrology, as well as the ancient Vedic texts. In India, Vamadeva’s translations and interpretations of the ancient Vedic teachings have been acclaimed in both spiritual and scholarly circles. He has worked extensively teaching, writing, lecturing, conducting research and helping establish schools and associations in related Vedic fields over the last more than three decades. Vamadeva sees his role as a “Vedic educator” helping to revive Vedic knowledge in an interdisciplinary approach for the planetary age. He regards himself as a translator to help empower people to use Vedic systems to enhance their lives and aid in their greater Self-realization. Yogashree N.V.Raghuram is the Spiritual Founder and Chairman of Yoga Bharati. He is currently "Professor of Yogic Sciences" with Swami Vivekananda Yoga Anusandhana Samsthana (SVYASA) Bangalore INDIA. He teaches Yogasanas, Pranayama, Dhyana, Cure for ailments like Arthritis, Asthma, Stress Management along with a complete Theoretical Yogic and Scientific background through lectures. Sri Raghuram is trained under some of the most renowned exponents of Yoga in India and has been practicing Yoga for more than 30 years. He has traveled to several countries including Germany, Austria, Switzerland, England, USA, Indonesia, Malaysia, Japan, Sri Lanka, Singapore and conducted Yoga Therapeutic and corrective courses (for ailments such as Bronchitis, Asthma, Back pain, Eating Disorders, Sleep Disorders etc). At Bangalore, he is involved in training Yoga Instructors and advises Ph.D. students in their intensive research on Yoga and its allied subjects. Swami Tattwamayananda is a senior monk of Ramakrishna order. He has served as editor, headmaster, teacher of Vedic scriptures, Sanskrit and Indian philosophy in different centers of the Ramakrishna Mission in India for more than thirty years. He was the Acharya of the training center for the monks of Ramakrishna Order in Belur Math, Kolkata, for six years before coming over to the the United States in January, 2012. Currently, Swami Tattwamayananda is the Assistant Minister of the Vedanta Society of Northern California, San Francisco. He has attended various academic and Sanskrit conferences in different parts of India and lectured in different parts of the United States.